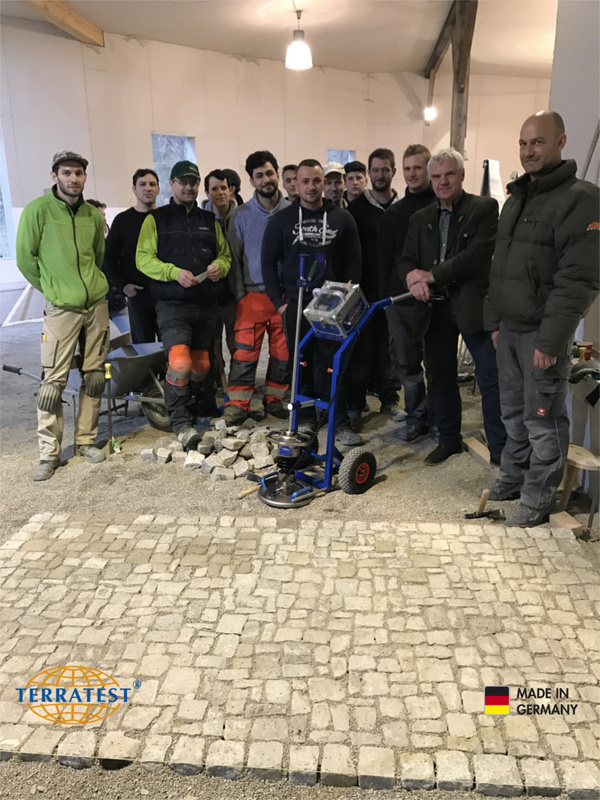 The light weight deflectometer was presented to budding foremen, masons and apprentices of the paving trade during a practise building site as part of the Master Craftsman’s examination for pavers being run as a course by the Chamber of Commerce in Graz / Austria. The light weight deflectometer for the dynamic plate load test is brilliantly suited to the assessment of compaction quality of the ground in paving works. The course participants were positively surprised at how easy the light weight deflectometer is to use and at how quickly the results are produced. A print out can be presented within 2 minutes, right on the building site, which alongside the dynamic strain module of the ground, also contains the GPS coordinates of the measurement point, as well as the date and time. The device simultaneously saves the measurements onto a USB stick and onto the internal storage for later analysis with the PC software. The light weight deflectometer TERRATEST 4000 Voice of course meets the Austrian test specification RVS 08.03.04 and is already being used by countless companies in earthworks, road construction and horticultural and landscaping construction in Austria. 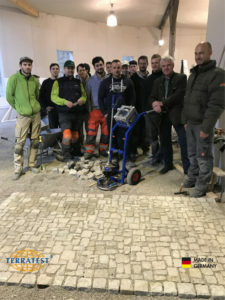 “We purchased the light weight deflectometer from TERRATEST®, because we liked the device’s equipment and the intuitive usability.” says David Mayer from the garden landscaping company of the same name in Graz. “An affordable price and customer-friendly service, even in Austria, convinced us completely.” Meyer continues. The strengths of the device come to fruition particularly in the construction of pavements and cycle paths, because there is no need for a 10 tonne counterweight, such as a loaded lorry or a barrel in order to carry out the measurement. “Now we will always measure the ground at the start of the work as soon as we have excavated, so that we don’t have any nasty surprises later on. In the past, we’ve fallen short of this.” Meyer admits frankly. Starting immediately, he will be able to carry out these tasks in next to no time on site with the light weight deflectometer, TERRATEST 4000 Voice.